Sanya were first out of the City of Sails. A recycled round-the-world boat heaving with Kiwi sailing talent led the fleet out of Auckland on the most treacherous leg of the Volvo Ocean Race. But the crew on Team Sanya were focused on holding their boat together rather than winning the 6700-mile fifth leg through the Southern Ocean. 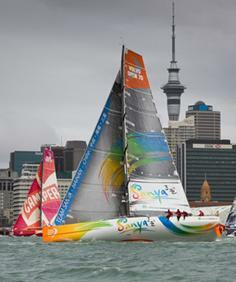 With eight New Zealanders on board the Chinese boat – the eight-year-old VO70 Telefonica Blue in a previous incarnation – leaving Auckland at the front of the fleet was a victory in itself. But after leaving the comforts of home, Kiwi skipper Mike Sanderson and his crew were bracing themselves for a rough night at sea – with easterly gales of 30-40 knots expected to greet the fleet as they left the Coromandel coast, brought by a low pressure system racing in from the northeast. Like all skippers in this fleet, Sanderson was crossing his fingers that his boat would hold strong in some of the toughest conditions seen so far in this race. But two-time race winner Sanderson is only too aware of last-placed Team Sanya’s damage record – a holed hull in leg one, broke rigging in leg two, and this week, paid special attention to a weakness in the rig. "It’s a tough forecast. We have some boat reliability issues, just because of the lack of time to put the boat together," said Sanderson. "But I think we are leaving here with a boat better prepared than anyone. Our crew is as fit as anyone given the time we have had here." Hometown heroes Camper were third out of the Waitemata Harbour, after an entertaining inshore circuit where the New Zealand boat locked horns with overall race leader Telefonica on the spinnaker run. Telefonica forced Camper into the line of spectator craft along the Devonport side of the harbour, and Camper co-skipper Chris Nicholson responded by deftly weaving through the appreciative spectator fleet. Nicholson was not looking forward to the first two days at sea, let alone the rest of this cold and wet voyage to Cape Horn. "Well it’s not pretty for the first 24 to 36 hours. We will probably go across a low pressure system and it’s going to be pretty rough. Then we have reaching for the first 4-5 days, which is not our strong point, but then we will be into running, and we think that is our strong point," he said. "I don’t think it’s the fastest boat that will necessarily pop out in the lead in the first few days. It will be the one that get this first shift right, which is kind of the way it’s been for most of the other legs. We’ll be happy to go drag racing in the heavy running conditions. "I feel very privileged to go out into the Southern Ocean in these types of boats with these types of crews. And i’m probably going to hate a lot of it, during it, but when I step off the boat in Brazil I will understand what an accomplishment it was." The under-performing Abu Dhabi Racing was second boat out of Auckland, but skipper Ian Walker was concentrating on weather reports rather than position schedules. "Right now all our focus is on the weather forecast, which looks absolutely diabolical for the first 36 hours. We just have to prepare our boat and our people as best we can." Leg five to Itajai is expected to take the fleet 18 days to complete.